I'm happy to have you back here for another week of zentangle challenge goodness. We are dealing with gross weather here. I know many of you have been posting about snow and cold too. Like, what the heck? My kids really wanted it to be SPRING right on time. Artoo said as he was going to bed on the 19th: "Wouldn't it be awesome if at midnight when it turns into the First Day of Spring, if all the snow would disappear and there would be grass and flowers everywhere?" sadly, it doesn't work that way, and also sadly - we got more and more snow, with more on the way. You get it, Henry. You understand. Chewie and i had to get out into the world though. we are going crazy with winter sickness. So we took Luna for a 3.5 km walk together. (2.17 miles) and we just pretended that it was spring time. because we are sick of it. She's so funny, she knows that she's not allowed in my bedroom, so this is what she does. She sits in the hallway and when i'm not looking, she puts one paw inside my room. What a rebel. Artoo had a pretty good week that ended with a fun birthday party at his friend's house. But as we were leaving he started getting a bit stuffed up, and now - yes you guessed it, he's full on sick. This next week of school is a short week, because they have parent/teacher interviews and then Friday is good Friday, but i think this little boy will be staying home with me all week - and focusing on getting better. It was a Beenie Boo adoption party! Here's Artoo and his owl Yago. Weekly Challenge #357: "Monotangle - Paradox time!" So, i love a good monotangle. 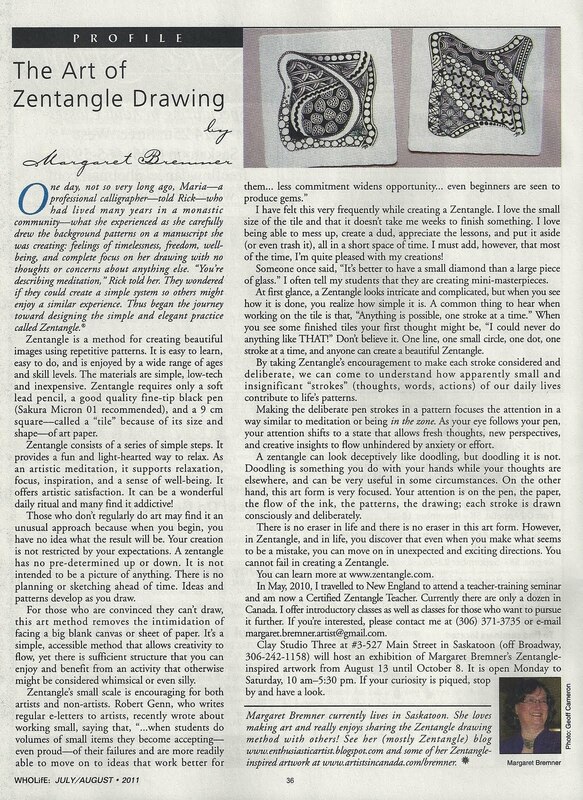 A monotangle is a term (originating here on this blog!) for a tile or piece comprised of ONLY ONE tangle, and it's tangleations. So for this week, i thought i'd revisit Paradox, because it is one of my favourite tangles, and i always find these challenges so fun to see the new and interesting ways that people use the same tangle in their tiles. So - this is a CLASSIC case of wishing i would have quit when i was ahead. There was a point during this tile that i LOVED it, and i should have stopped then and left well enough alone, but for some reason i kept going. that moment is RIGHT HERE. I really like how this looked, so i may go back again and try to recreate it. BUT - as always, i share with you my finished tile, regardless of whether or not i actually like it. lol. And if you're on the Zentangle Mosaic App or Instagram - i'm @iamthediva - come on by and follow me, and i'm going to be using hashtags on the app for each of my weekly challenges. So if you're game - use the hashtag #DC357 (Diva Challenge #357) for your tile this week! You can also search in the app for people's contributions to the challenge by clicking on the hashtag from inside the app, or using the search function. ...thanks for the challenge...it´s fun! But...omg...Mister Linky is missing !? Laura, I love your work. I don't think I've ever seen darkening the end of the line as you do in this Paradox. What a cool effect! Hallo Laura, Thanks for this challenge. Love your Paradox. It´s so sorry, that Mr. Linky isn´t here. Hope spring comes to you soon! I hope Artoo feels better soon. I'm also looking for Mr. Linkey. I don't know why people are giving you their site addresses, by in case you want them, mine is http://tanglesharing.blogspot.com/2018/03/diva-357-paradox-monotangle.html Thanks. Hey, Laura...I rather like your tile with the dark borders in it, so don't throw it away. It is good. Hey, where's the Linky Machine???? Wishing Artoo a speedy recovery! I like your final product. I thought it was tres unique and made the paradoces (?) stand out! I get it though. Many times I could've just stopped. :) Thank you for the challenge! Hope Artoo feels better! I really like the bold black lines you ended up with. For me, you stopped at the right moment! Hope Artoo is feeling better. If it makes you feel any better, we had snow here in North Carolina, which has absolutely nothing northern about it, on the 24th of March! Hey Laura, thank you for the work you do for us. This challenge resulted in one of the oddest tiles I've ever done. Creativity so surprises us! I love yours. Going to look at other people's results now. Paradox is my favorite tangle; so this was right up my alley. I did 2 tiles. Thanks again for all your work. Was out of town and did not get a chance to post this sooner. Tried to do with my tablet but that did not work. I love Paradox.